Keywords: Class II division 2; deep bite; impacted canine; intrusion arch. Class II malocclusion is a frequently observed clinical problem, occurring in about 10% of Indian population. ,, Many investigators have pointed out that a Class II molar relation occurs in a variety of skeletal and dental configurations. ,,, Class II division 2 malocclusion is characterized by a Class II molar relation coupled with retroclination of central incisors and overlapping by the lateral incisors. High lower lip line may be the cause of retroclination of upper central incisors in Class II division 2 malocclusion. Moorrees et al.,  Buschang et al.,  and Walkow and Peck  all concluded that Class II division 2 malocclusion shows reduced intercanine width in the lower arch. This may cause impaction of the canine in many cases due to inadequate space. This malocclusion shows a high genetic tendency , and is often associated with small-sized teeth. Basdra concluded that Class II division 2 malocclusions are closely associated with peg-shaped lateral incisors, impacted canines, hypodontia, and transpositions. These cases are usually characterized by severe, traumatic deep overbite with lingually inclined maxillary incisors. The first step of treatment in such cases is usually to start correcting the deep bite by intrusion and proclination of the incisors, extrusion of the molars, or both. Class II malocclusions can be managed with diverse treatment methods such as functional appliances, extraoral traction, fixed appliances, extraction procedures, and surgery. 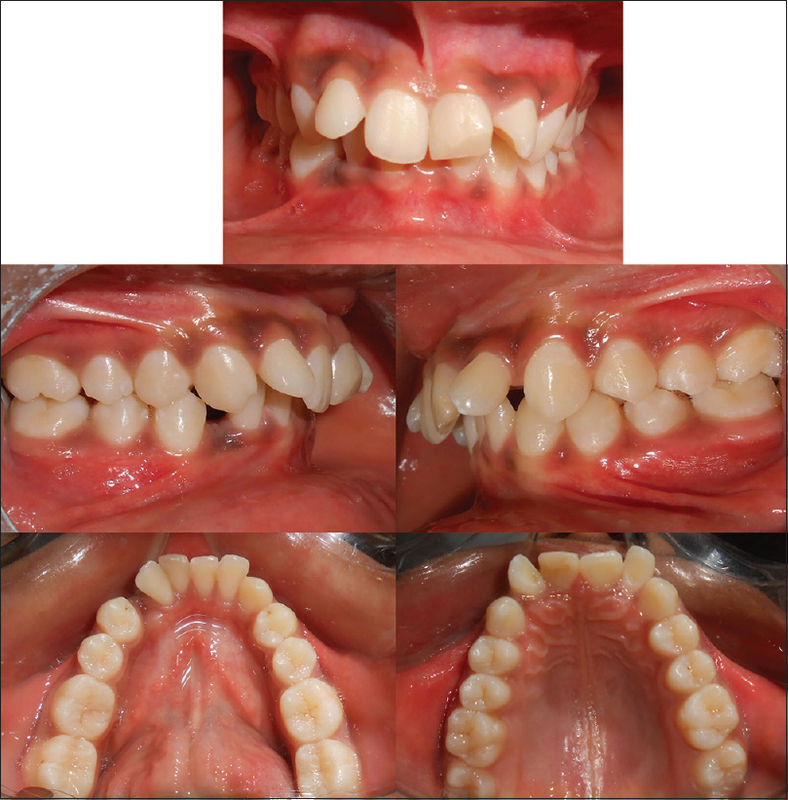 This case report describes nonextraction treatment approach of a Class II division 2 subdivision malocclusion with impacted lower canine. 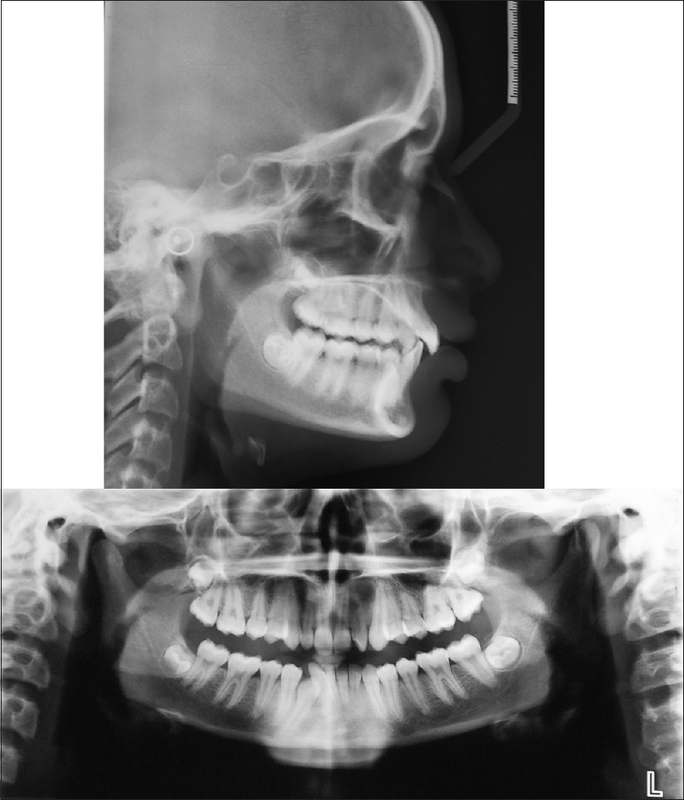 A 15-year-old female reported with the chief complaint that her upper front teeth are irregularly placed. She was also concerned about her missing lower right canine. During the questionnaire, the patient revealed that her parents presented with a similar malocclusion. No relevant medical history was reported. The clinical examination showed mild convex facial profile, horizontal growth pattern, and competent lips [Figure 1]. Intraoral examination showed retroclined upper central incisors and malformed lateral incisors. The lower right canine was missing. The patient presented an Angle's Class I molar relation on the left side, end-on molar relation on the right side, and 90% deep bite. 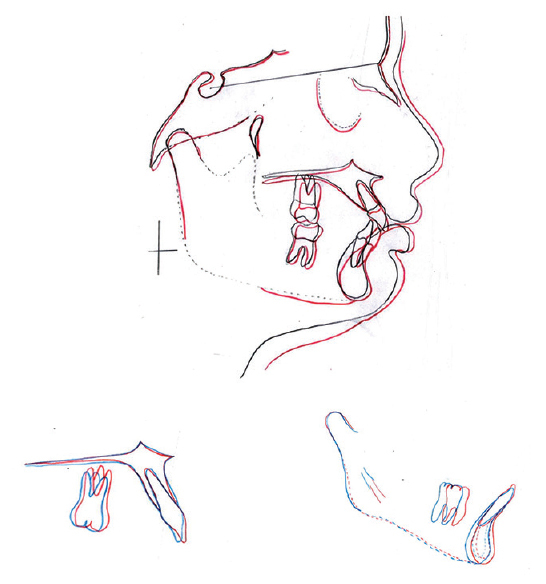 The lower incisors were elongated, and the curve of Spee was steepened by 4 mm [Figure 2]. Panoramic radiograph showed the presence of 32 teeth without bone loss. It indicated that the lower right canine was vertically impacted. 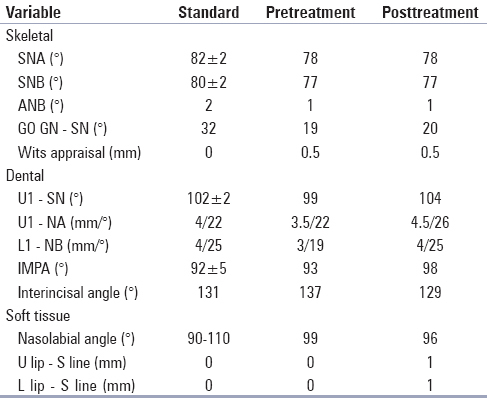 A lateral cephalometric analysis [Table 1] revealed retrognathic maxilla with SNA - 78°, retrognathic mandible with SNB - 77°, a skeletal Class I jaw base relationship with ANB - 1°, and Wits appraisal 0.5 mm. The effective mandibular length (Co-Me) was 106 mm and GO GN-SN 19° indicative of a horizontal growth pattern. Upper incisors were lingually inclined with U1 - SN 99°. Lower incisors were inclined ideally over the basal bone with L1 - MP 93° [Figure 3]. 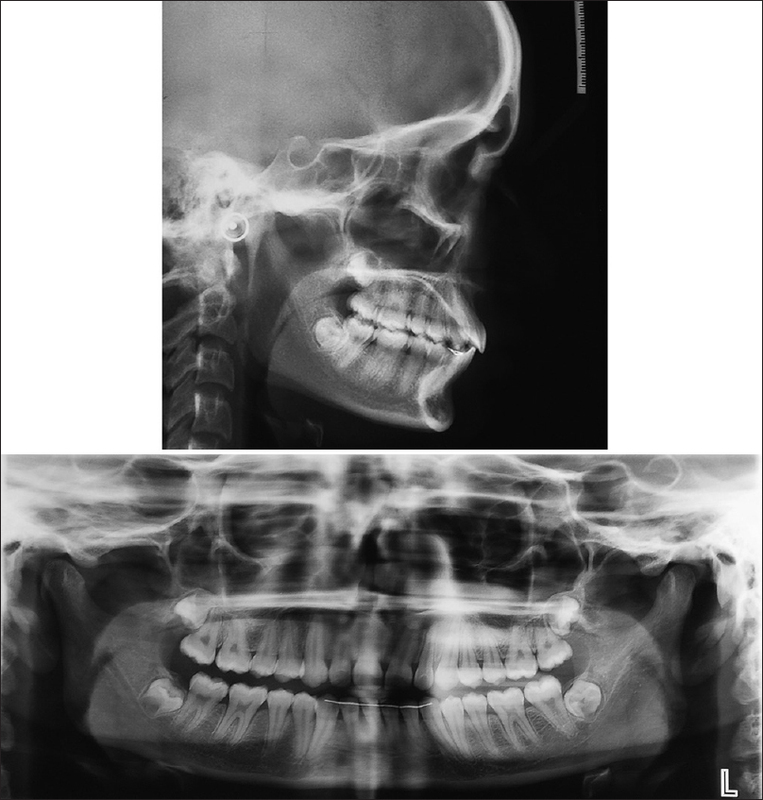 The case was diagnosed as an Angle's Class II division 2 subdivision malocclusion on Class I skeletal jaw bases with a severe deep overbite. The treatment objectives included improvement of the deep overbite by means of leveling the upper and lower arches, disimpaction of the lower right canine, correction of end-on molar relation on the right side, and attainment of an esthetically pleasing profile and functionally stable occlusion. 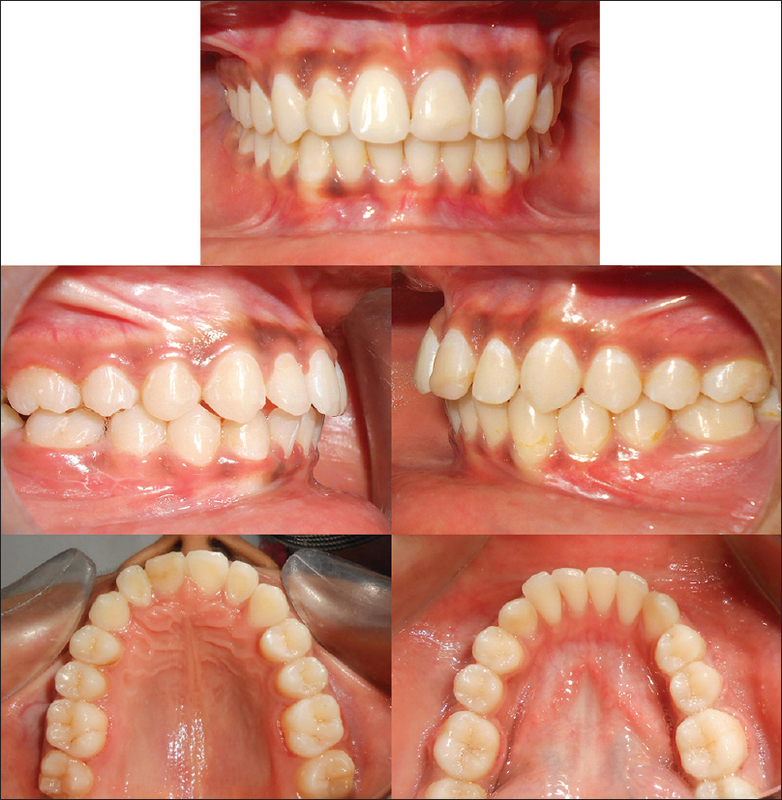 The treatment plan was nonextraction with MBT appliance to align and level the arches. Class II division 2 malocclusions requires correction of interincisal angle, to achieve class I incisor relationship and stable overbite relation. Intrusion arch was planned in the upper arch to correct extruded and retroclined upper central incisors. The vertical loop would be used for forced orthodontic extrusion of lower right canine after creating space. Bondable lingual retainer was decided for posttreatment stability. MBT appliance 0.022 × 0.028˝ slots (Ormco, Glandora, CA, USA) were used. Anchorage was enhanced by transpalatal arch placed on banded maxillary first molars. 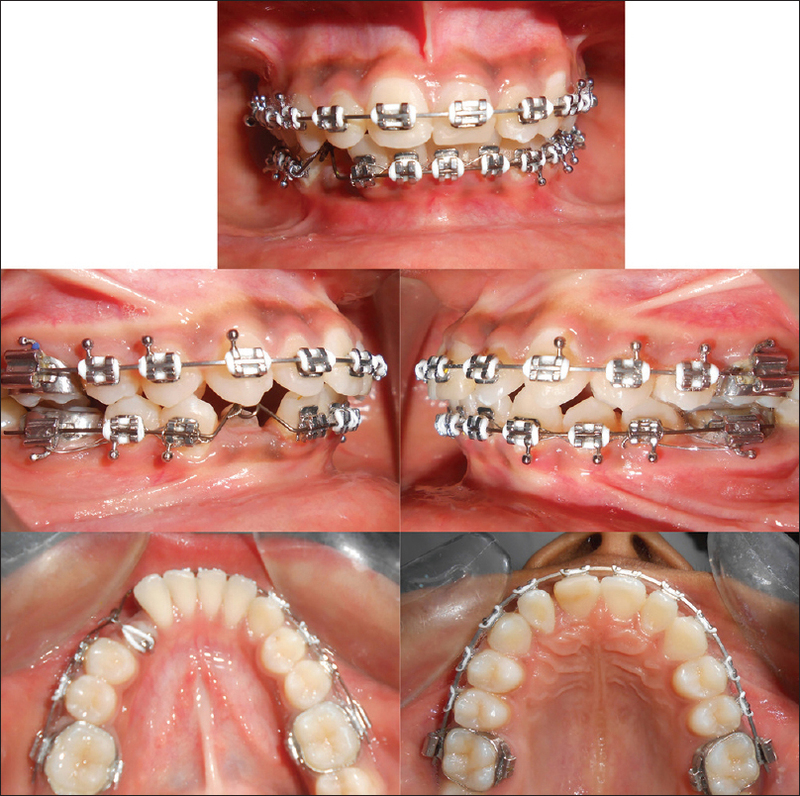 Alignment and leveling in the maxilla were accomplished with the following sequence of arch wires: (a) 0.016 heat-activated nickel-titanium (NiTi) archwires, (b) 0.018 stainless steel archwires, and (c) 0.017 × 0.025 stainless steel archwires. After 3 months of alignment, 0.018 stainless steel intrusion arch was placed in the upper arch to level the maxillary central incisors and correct deep bite [Figure 4]. Fifty grams of force was used to intrude central incisors. After deep overbite correction, MBT brackets were bonded on the mandibular dentition. After initial alignment and leveling, space was opened for the lower right canine using NiTi open coil springs on 0.017 × 0.025 stainless steel archwires. The impacted canine was exposed by surgical means, and a bondable button was placed. Orthodontic traction was applied after 2 weeks of exposure, and a vertical loop made of 0.018 stainless steel was used to apply extrusive forces on the canine [Figure 5]. Both the arches were coordinated on 0.019 × 0.025 stainless steel archwires. Palatal root torque of 11 and 21 was incorporated in 0.021 × 0.025˝ titanium molybdenum alloy archwires to correct torque of upper incisors. Finishing was accomplished on 0.021 × 0.025˝ braided stainless steel arch wires. Gingivotomy was performed before bracket removal to improve the gingival contour of 11 and 21. Composite restorations of incisor crowns were done to achieve ideal height-width ratio. At the debond visit, bonded lingual retainers were placed. The patient is being followed every 6 months for follow-up. The total active treatment period was 20 months. The treatment objectives set in the pretreatment planning were achieved. The retroclined incisors, overbite, and steep curve of Spee were corrected. The lower right canine was disimpacted and brought into the occlusion. The end on molar relation was corrected into a Class I molar relation on the right side. The mandibular plane angle and lower anterior facial height showed minimal changes [Figure 6]. The posttreatment models, X-ray, photographs showed axial inclination of upper and lower incisors corrected [Figure 7], [Figure 8] and [Figure 9]. The posttreatment orthopantomogram showed parallelism of roots. The gingival-tooth relationship was improved for the upper central incisors. Overall micro esthetics were achieved after gingivotomy and composite restoration of 12, 21, and 22. At the end of treatment, the patient had a harmonious profile and functionally stable occlusion, along with a pleasing smile and improved smile arc. Class II division 2 malocclusion is characterized by permanent mandibular incisors occluding posterior to the cingulum of retroclined permanent maxillary incisors. It frequently presents with reduced overjet and increased overbite. Classically, the permanent maxillary central incisors are retroclined and the maxillary lateral incisors are proclined and mesiolabially rotated. The position and shape of the lower lip to the maxillary incisors have been implicated as the principal etiological factor in the development and relapse of Class II division 2 malocclusion. ,,,,, Combination of hyperactivity of the labial musculature and a higher resting lip line is thought to cause maxillary incisor retroclination. , A reduced crown-root angle (collum angle) has been reported for the upper incisors in class II division 2 malocclusions, which can contribute to their characteristic inclination. , Class II division 2 may show polygenic inheritance and associated with various anomalies such as peg-shaped lateral incisors, transposition, and malformed teeth. , Most of the class II division 2 malocclusions manifest with a severe deep bite. Various treatment options and appliance designs have been advocated for the correction of excessive overbite. , According to Nanda, the correction of deep overbite can be achieved by four types of tooth movement, i.e., intrusion of incisors, proclination of anterior teeth, extrusion of posterior teeth, and surgical methods. Extrusion of posterior teeth results in increasing the lower anterior facial height, clockwise rotation of the mandible, which may worsen class II molar relationship and retrognathic profile. Deep bite was corrected by intrusion and proclination of upper central incisor in this case. In cases presenting during the growth period, the forward growth of the mandible can be used to improve the anteroposterior discrepancy with the maintenance of an adequate vertical skeletal relationship. However, adult patients no longer experience catch-up growth and often need a surgical approach for sagittal correction. , In many cases, the mandible gets locked in its backward position due to severe deep bite. Correcting the axial inclination of retroclined incisors causes unlocking of the mandible. This, in turn, leads to simultaneous correction of class II molar relation. The increased overbite predisposes to a reduced lower intercanine width, which may be the cause of canine impaction in this case. In our case, we corrected axial inclination of retroclined upper central incisors which allowed mandible to unlock the mandible and moved it in the forward direction. This got Class II molar relation into Class I relation. To promote stability, the interincisal angle requires correction by placing the incisal edge of the mandibular incisors anterior to the midpoint or centroid of the upper incisor roots;  this was achieved in this case. The shape and position of the lips in Class II division 2 malocclusion not only affect incisor inclinations but can also complicate orthodontic mechanotherapy and posttreatment stability. Deep bite correction helps in unlocking of mandible which corrects Class II molar relation. The interincisal angle must be normalized which gives long-term treatment stability. Sridharan K, Udupa V, Srinivas H, Kumar S, Sandbhor S. Prevalence of class II malocclusion in Tumkur population. J Dent Sci Res 2011;2:1-5. Peter S. Epidemiology, etiology and classification of malocclusion. In: Preventive and Community Dentistry. 3 rd ed. New Delhi: Arya Publishing House; 2006. Brunelle JA, Bhat M, Lipton JA. Prevalence and distribution of selected occlusal characteristics in the US population, 1988-1991. J Dent Res 1996;75:706-13. Angle EH. Treatment of Malocclusion of the Teeth. Philadelphia: SS White; 1907. Case CS Principles of occlusion and dento-facial relation. Dent Items Interest 1905;27:489-527. Pancherz H, Zieber K, Hoyer B. Cephalometric characteristics of class II division 1 and class II division 2 malocclusions: A comparative study in children. Angle Orthod 1997;67:111-20. Moorrees CF, Gron AM, Lebret LM, Yen PK, Fröhlich FJ. Growth studies of the dentition: A review. Am J Orthod 1969;55:600-16. Buschang PH, Stroud J, Alexander RG. Differences in dental arch morphology among adult females with untreated class I and class II malocclusion. Eur J Orthod 1994;16:47-52. Walkow TM, Peck S. Dental arch width in class II division 2 deep-bite malocclusion. Am J Orthod Dentofacial Orthop 2002;122:608-13. Basdra EK, Kiokpasoglou M, Stellzig A. The class II division 2 craniofacial type is associated with numerous congenital tooth anomalies. Eur J Orthod 2000;22:529-35. Marcovic MD. At the crossroads of orofacial genetics. Eur J Orthod 1992;14:469-81. Mossey PA. The heritability of malocclusion: Part 2. The influence of genetics in malocclusion. Br J Orthod 1999;26:195-203. Haraguchi S, Yamashiro T. Treatment of adult class II division 2 patient with metal hypersensitivity. Angle Orthod 2014;84:902-9. Tausche E, Harzer W. Treatment of a patient with class II malocclusion, impacted maxillary canine with a dilacerated root, and peg-shaped lateral incisors. Am J Orthod Dentofacial Orthop 2008;133:762-70. British Standards Institute. British Standard Incisor Classification. Glossary of Dental Terms, BS 4492. London, UK: British Standards Institute; 1983. Ridley DR. Some factors concerned with the reduction of excessive overbite in Angle's class II division 2 malocclusion. Trans Br Soc Study Orthod 1960;118-40. Nicol WA. The lower lip and the upper incisor teeth in Angle's class II division 2 malocclusion. Dent Pract 1963;14:179-82. Posen AL. The influence of maximum perioral and tongue force on the incisor teeth. Angle Orthod 1972;42:285-309. Mills JR. The problem of overbite in class II, division 2 malocclusion. Br J Orthod 1973;1:34-48. Fletcher GG. The retroclined upper incisor. Br J Orthod 1975;2:207-16. Karlsen AT. Craniofacial characteristics in children with Angle class II div 2 malocclusion combined with extreme deep bite. Angle Orthod 1994;64:123-30. Basdra EK, Kiokpasoglou MN, Komposch G. Congenital tooth anomalies and malocclusions: A genetic link? Eur J Orthod 2001;23:145-51. Sana S, Bansal A, Sami L, Tapashetti R, Gaikwad S. Anterior deep bite malocclusion treated with connecticut intrusion arch: Biomechanical consideration. J Clin Diagn Res 2014;8:ZD30-2. Kim SH, Park YG, Chung K. Severe class II anterior deep bite malocclusion treated with a C-lingual retractor. Angle Orthod 2004;74:280-5. Nanda R. Correction of deep overbite in adults. Dent Clin North Am 1997;41:67-87. 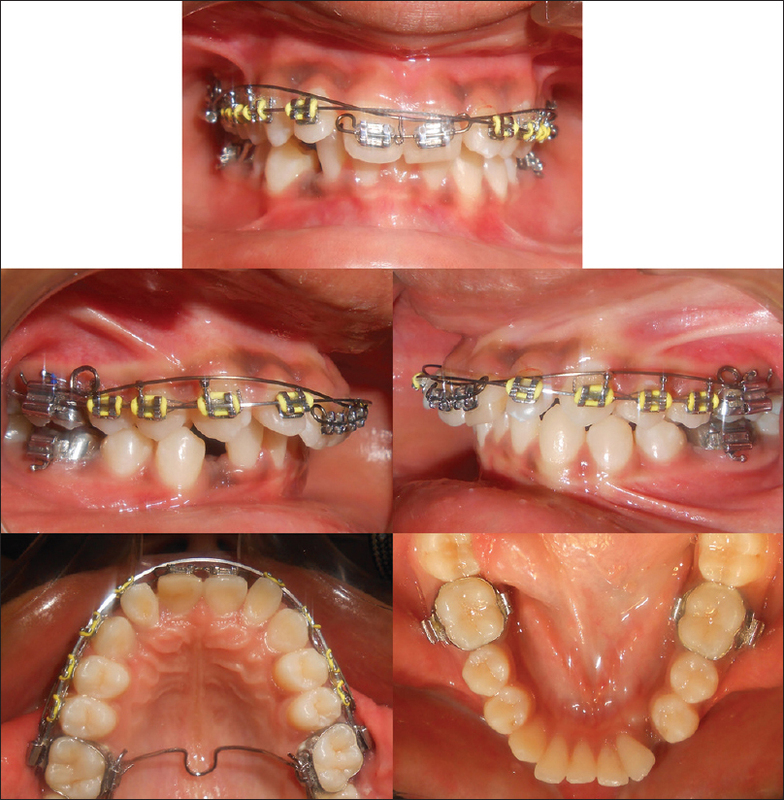 Nanda R. Biomechanics and Esthetic Stratergies in Orthodontics. Copyright 2005. St. Louis, Missouri Elsevier Inc.; 2005. 34. Proffit WR, Fields HW, Sarver DM, editors. Contemporary Orthodontics. 4 th ed. St. Louis (MO): Mosby Elsevier; 2007. Burstone CR. Deep overbite correction by intrusion. Am J Orthod 1977;72:1-22. Proffit WR, Fields HW, Sarver DM. Contemporary Orthodontics. 5 th ed. Copyright 2013. St Louis, MO: Mosby, Elsevier; 2013. Houston WJ. Incisor edge-centroid relationships and overbite depth. Eur J Orthod 1989;11:139-43. Class II division 2; deep bite; impacted canine; intrusion arch.